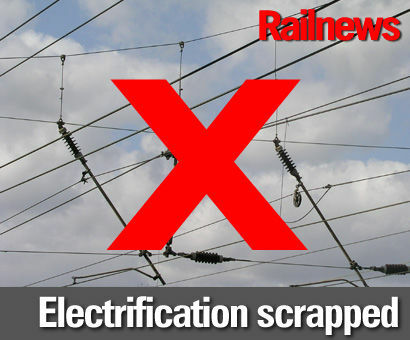 ELECTRIFICATION schemes between Cardiff and Swansea, north of Kettering to Sheffield, and between Windermere and Oxenholme have been cancelled by the Department for Transport. Instead, these routes will rely on the ‘new technology’ of bi-mode trains, the DfT said. Meanwhile, transport secretary Chris Grayling has postponed a government commitment on future railway investment, saying that ‘Network Rail’s progress on improving its efficiency in recent years has fallen short of my expectations’. Chris Grayling said: “From Autumn 2017, passengers in Wales will benefit from new Intercity Express trains which will each deliver over 130 more seats, faster journey times and improved connectivity for South Wales to London with 40 per cebt more seats in the morning peak once the full fleet is in service. “These innovative new trains switch seamlessly between electric and diesel power, delivering faster journeys and more seats for passengers without disruptive work to put up wires and masts along routes where they are no longer required. Network Rail agreed that ‘electrification still has its place’ in certain cases, while Opposition politicians have reacted with dismay. The scheme to extend Great Western electrification past Cardiff to Swansea was added to the project at a relatively late stage. More recently, GW electrification had already been trimmed back, omitting Oxford, Newbury and Bristol Temple Meads, along with two Thames Valley branches. Labour's shadow transport secretary Andy McDonald said: “The Tories have been promising the electrification of the Great Western Main Line from Paddington to Swansea since 2012 and today’s announcement confirms that they have been taking people for a ride. “The cancellation of works means passengers will be denied the faster, greener, more reliable train journeys they were promised, and South Wales will miss out on the economic activity that improved rail services deliver. Meanwhile, Northern said that a newly-converted bi-mode version of the cascaded Class 319 Thameslink units will be used on the Lakes Line to Windermere. New diesel trains built by CAF for Northern are due to follow the 769s into service in 2019. The electrification announcement has come at the same time as the publication of High Level Output Specifications from the government, which set out railway ambitions for the five years from 2019, Network Rail’s Control Period 6. Emphasis is being placed on renewals rather than enhancements, but more information about future projects has been promised for later in the year, and no figure has been given in the present ‘Statement of Funds Available’, the financial details of which have been deferred until October. “Five years ago, the Government were trumpeting the biggest investment in the railways since the Victorians. Today, passengers face spiralling fares while investment is put on the back burner. Passengers in the north will feel most cheated by today’s announcement, given that long-delayed TransPennine and Midlands electrification projects seem to have been dropped." Transport Focus chief executive Anthony Smith said: “The emphasis from Government on maintaining and improving the reliability of existing services is welcome – this is a key rail passenger priority for improvement. Peter Loosley, policy director of the Railway Industry Association, said: “We strongly welcome the Government’s recommendation to the Office of Rail and Road that that there should be greater supply chain certainty. We wholeheartedly echo the Department for Transport’s backing for good visibility of Network Rail project pipelines to help offer reassurance to the railway supply sector and to encourage investment in skills, technology and innovation.